Michelle Pretorius, whose photo graces the cover of Issue 15 (Fall 2014), was kind enough to chat with us about how she was able to capture this photo, and what it means to her. Michelle: The clouds rolled in during a sweltering July day. The sky menaced, forming dramatic eddies and whorls, reminiscent of cinematic renditions of the apocalypse. The Ghostbusters theme song came to mind as I started shooting the cityscape from a 14th floor window. I loved how the Chicago skyline visually interacted with this display of nature, reflecting subtle variations of bluish-gray hues. Within twenty minutes the sky was clear and calm again. Not a drop of rain had fallen, the event fleeting and confounding. 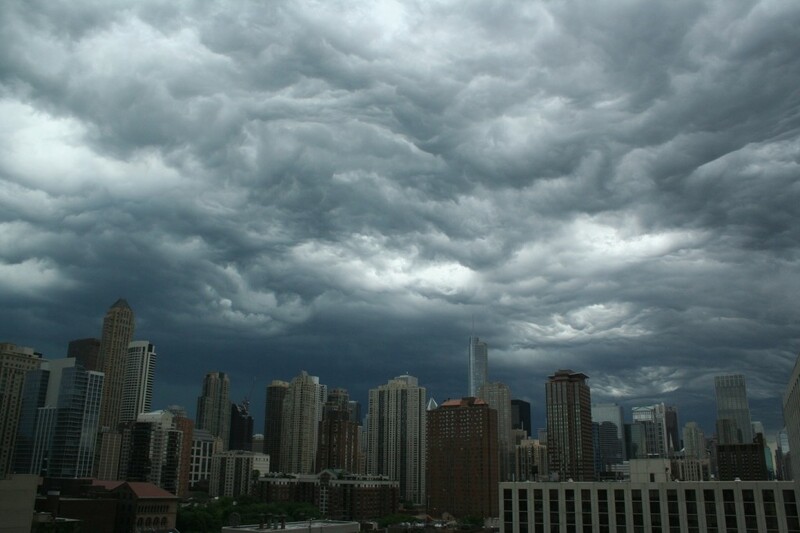 Then again, that’s what we’ve come to expect of Chicago weather. Michelle was born and raised in South Africa where she received a B.A. at the University of the Free State. She has lived in London, New York and the Midwest. She graduated from Columbia College Chicago with an MFA while working as a freelance event photographer. She is currently a PhD candidate in Creative Writing at Ohio University. When she is not writing or taking photographs, she enjoys theater, a fine scotch, and discussing stories with her writing group. She is an abject failure as a drummer, skydiver, runner, and chess champion, but enjoys doing it anyway.